Psst… I’m going to a surprise book shower today. To celebrate with Holley, who labored long and hard to deliver words of encouragement to us, our friend Stephanie invited us to surprise Holley by sharing a post about a woman we think is #AlreadyAmazing. Holley spends so much time and care crafting messages to let us know we’re already amazing in the Father’s eyes, I thought I’d let her know why she is already amazing, too! * You’re beautiful. I love how your eyes light up when you’re excited about a new idea God’s given you — and how your heart is energized by empowering other sisters to cherish theirs too. * You’re courageous. You open up your heart, changing the world by showing us how God is changing yours. * You’re real. Talking with you makes my heart lighter, knowing I’m not the only one who forgets to put the coffee filter in the coffee maker. You turn insecurities into a weapon of God’s love and friendship: transparency. * You’re creative. I love what you did with this book, inviting women everywhere to embrace who God’s called us to be. I had so much fun taking surveys, jotting notes and circling answers, like girlfriends staying up late at a slumber party — talking about what we like — and what we don’t. * You’re a heart to heart friend. You’ve made receiving a spiritual blessing, being the ears and heart of God to me. You make the world a sunnier place by sitting out on the limb with me, with your laughter and prayers. I love how you dare us to embrace all of who we are in this book, You’re Already Amazing, by sharing so honestly how you found yourself on this journey… and continue to share it with us now. Is there a woman in your life who is #AlreadyAmazing? Pull up a chair. Click to share a comment. If you’re looking for a faith dare to be all God created you to be, pick up You’re Already Amazing. It’s a treat for your soul. You can also join Holley and walk through the book with the Bloom (in)courage Book Club. Each week, there will be a post to go with a chapter, a video with Holley, and ways the chat together about it. I’ve already purchased the book when you first mentioned it. But I’m so glad to learn that it is the Bloom book club choice. I enjoy reading along with that group. I have several friends who have walked with me through some very difficult times. Jamie quickly comes to mind as does Sue, Terri, Helen and Anna May. I am so thankful to the Lord for bringing these women into my life. Best of all, we share the love of Jesus and that creates such a tight bond of love between us. All of the women in my life are amazing, from the women I have a personal relationship with to women like Holley Gerth & Bonnie Gray whom I’ve never met but pour encouragement and love into my life. Thank you to all of you, I love and appreciate you very much! Love this sweet post. Today, my vote for an amazing woman is my mom, all the way. Even though her health is slowing, she keeps putting one foot ahead of the other and always looks for ways to pour her love into our lives. I am humbled by her spirit over the years, and hope I can grow a heart like that one day too. There are some women in my life that are examples of life, they teach every day with their own behaviour. They trust in our Lord. They are patient, lovely. They love sharing, given their time, they listen,……. I can rely on them. 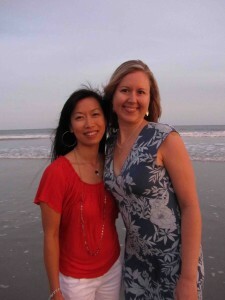 And now having you as a special friend is a plus…..I can say I´m really fortunate! Lots of love and continue encouraging us always. Thank so so much! Yay for Holley! It’s evident from her writting that she is a genuine friend with a huge heart! Friend, thank you so much for these beautiful words! I miss you and thank Jesus for making our paths cross. You’ve got a special place in my heart forever! A book shower–I love that! What a wonderful idea! 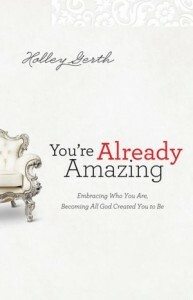 Yes, Holley is amazing–awesome new book!! And YOU are amazing too, Bonnie, for never ceasing to encourage and inspire!!!! Blessings! Oh Bonnie, thank you for sharing this post about Holley and her wonderful book, I think you are both amazing. I would also like to lift up my Mom, who has been sacrifically loving and giving her entire life, and a lot of fun too, she loves to laugh and she is always so joyful. and also, my best friend Elaine, who is now caring for both parents by herself, one with Alzheimers and one with Dementia. Both she and my Mom love the Lord and that brings us even closer together.